No matter how clean your bathroom is, if the faucets are dull and lifeless, it just doesn't look clean. Faucets that shine make the whole room look clean and inviting. The trick to sparkling faucets lies in removing any buildup of soap scum and hard water deposits and finishing of with rubbing alcohol to shine and disinfect. Begin by deep cleaning faucets. Wet a cloth of full strength white vinegar. You can purchase a quart of white vinegar in the grocery store for about $1.00. Scrub down the faucet with the cloth. If residue and hard water buildup is present, you will need to remove it. Saturate the cloth with white vinegar. 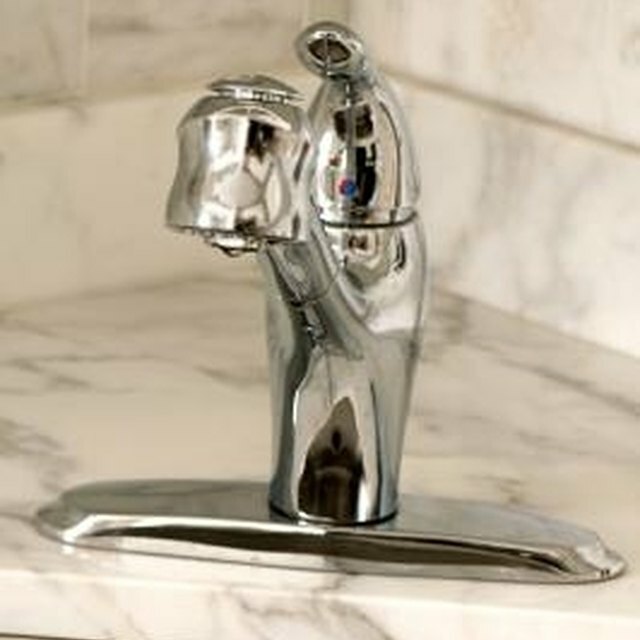 Lay the cloth over the faucets being sure to cover all areas that show signs of calcium buildup. This is the whitish crusty residue that clings around the faucets. Allow it to rest for 15 minutes to soften the calcium buildup. Remove the cloth and scrub the area with a soft bristled brush. The acid in the vinegar will soften the buildup making it much easier to remove with a little scrubbing. Rinse with cold water and dry with a soft dry cloth. Inspect the faucet area for any remaining debris or residue. Use a discarded toothbrush to clean under the edges of the faucets between the faucet and the base of the sink. This area tends to collect dirt and grime. Check the overflow vent for any dirt and grime that may have collected there. Clean with the toothbrush and rinse clean. Scour the sink with a little shampoo on a clean cloth. Shampoo is designed to remove body oils and will cut through soap scum and dirt leaving the sink sparkling clean. Wipe down with a clean dry cloth. Fill a spray bottle with undiluted rubbing alcohol. Be sure to clearly label the bottle to prevent accidental misuse. Store rubbing alcohol out of the reach of children. Spray down the entire faucet and sink area with rubbing alcohol and wipe with paper towels or a clean dry cloth. Polish to a shine. Rubbing alcohol is great for cleaning any area of the bathroom. It cleans and disinfects leaving faucets and other fixtures sparkling clean. Spray down toilets seats and floor tiles around the toilet to kill germs.